Click here to read the latest updates of this trial. The LEGATO-HD Phase II clinical trial will examine what effect different doses of an investigational drug called laquinimod may have on people with HD. Laquinimod is an investigational drug being studied to see if it may have an effect on the symptoms of HD, including abnormal movements, memory problems, and emotional disorders. Laquinimod has already been investigated for the treatment of multiple sclerosis (MS) as it acts both on the immune system and within the central nervous system. It has been suggested that laquinimod may have an effect on the progression of HD. This trial is being conducted to determine if laquinimod helps with the signs and symptoms of HD. There are risks associated with laquinimod, and the trial physician will discuss these risks with you. The primary objective of this study is to assess the efficacy of laquinimod 0.5, 1.0, and 1.5 mg qd in patients with HD after 12 months of treatment using the UHDRS-TMS. 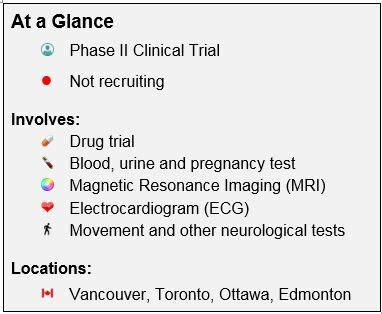 Treatment with any investigational product within 12 weeks of screening or patients planning to participate in another clinical study assessing any investigational product during the study.